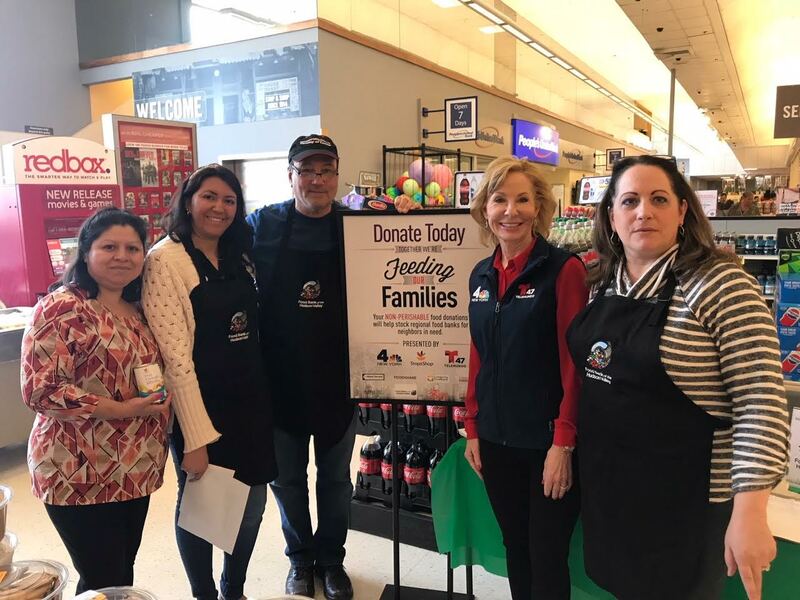 Sarah Wallace of WNBC’s I-Team was at the Nanuet Stop & Shop on Saturday, April 28 to assist NBC 4 New York’s annual food drive in partnership with Telemundo 47 and Stop & Shop. She was joined by members of the Food Bank for the Hudson Valley. Securing 1.9 million meals for local families in need and restocking eight local food banks with more than 240 tons of needed non-perishable goods, NBC 4 New York and Telemundo 47 announced the final results for their second annual Feeding Our Families / Alimentando a Nuestras Familias food drive on Saturday, April 28. Hosted in partnership with Stop & Shop Supermarkets, 254 individual Stop & Shop store locations in New York, New Jersey and Connecticut served as community collection sites for the station’s massive, one-day food collection campaign. “WNBC is committed to fighting hunger and making a difference in every community we serve. On Saturday, we did just that. Together with our partners at Telemundo 47, we launched a massive, one day call-to-action unprecedented for our stations in both size and scope. I would like to thank our viewers for participating and donating; nearly two million meals will now be delivered to local families in need,” President and General Manager of NBC 4 New York Eric Lerner said. The participating food banks include the Connecticut Food Bank, Community Food Bank of New Jersey, Fulfill Food Bank, Food Bank for New York City, Feeding Westchester, Food Bank of the Hudson Valley, Foodshare and the Island Harvest Food Bank. Saturday’s totals also doubled the results from the stations’ 2017 inaugural food drive. Last year, the stations’ first Feeding Our Families / Alimentando a Nuestras Familias food drive generated 900,000 meals and more than 120 tons of non-perishable goods for local families in need. WNBC I-Team reporter Sarah Wallace was on hand at Stop & Shop of Nanuet to help promote the food drive and meet with the public.